This recipe is the Featherpuff Bread from the Laurel’s Kitchen Bread Book. I would never have thought to put cottage cheese in a bread recipe, but Laurel just raved about how light this bread turns out, which makes it ideal for cinnamon rolls. The thing I like best about this recipe is that the high protein from the milk, eggs, and cottage cheese makes me feel satisfied, but not heavy. And the kids don’t have a sugar high either. 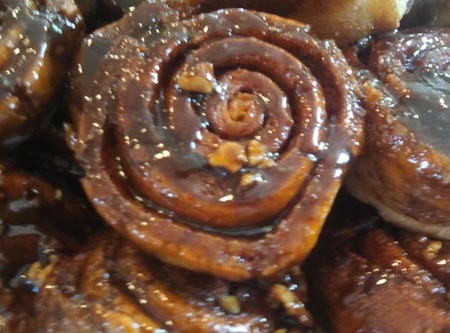 In the picture, our cinnamon rolls almost look like chocolate sticky buns, but that’s just our natural sweetener, rapadura. It tastes quite good, but it does look rather dark. 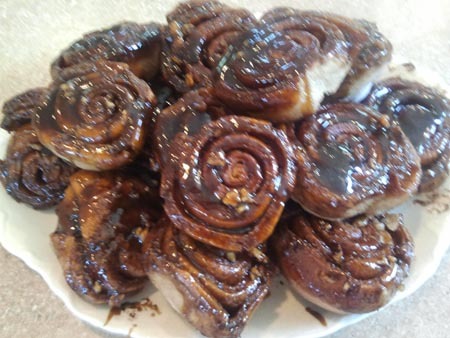 If you already bake with hard white wheat flour, you may not be impressed with this, but do you see the cinnamon roll near the top of this picture that looks like white bread is showing through underneath the caramel topping? That, my friends, is 100% whole wheat flour from Prairie Gold Hard White Wheat. If you have access to it, you definitely want to use that kind of wheat flour for these rolls. It makes a BIG difference, especially if you mill it yourself. We start the dough before bedtime on Friday night using the full amount of yeast. The dough rises in the fridge, and it’s ready to roll out into cinnamon rolls for a special Saturday family breakfast. One trick to making these rolls light is to roll them up loosely – they need room to rise! 1 recipe makes 2 9×13 pans of cinnamon rolls. Warm the cottage cheese gently in a saucepan. Remove form heat and mix in the eggs, honey and water, taking care that the cottage cheese is not so warm that it cooks the eggs. Mix the flour and salt thoroughly, making a well in them and adding the cottage cheese mixture and the yeast mixture. Mix to make a dough, and test for consistency, adding more water or flour if needed. The dough should be very soft. If it’s sticky, add just enough flour to keep it from sticking to the counter – not too much or the dough will get too tough to rise properly. Knead by hand for about 15 minutes, or by machine for 8 minutes, adding the butter in pieces halfway through the kneading. Then place it in a large buttered bowl and cover it with a towel. Let it rise overnight in the refrigerator. In the morning, take the dough out of the bowl and cut it into two pieces. Dust a surface with flour and shape each piece of dough into a rectangle. Roll them out into large rectangles that are about 3/8″ – 1/2″ thick. Brush half of the stick of melted butter on each rectangle. Stir together the Rapadura and cinnamon. Using a spoon, sprinkle a thin layer of the mixture over each piece of dough. Roll the dough up somewhat loosely – jelly roll style – and pinch the end to seal. Set aside while you make the caramel topping. To make the caramel topping, mix together the honey, water, soft butter and Rapadura. Spread the mixture in the bottom of two 9″ x 13″ pans. If you’re using pecans, sprinkle them over the caramel. To slice the cinnamon rolls, take a length of strong thread or fishing line and tie the ends to two pencils. Slide the thread under one of your long rolls and cross the two pencils, pulling to cut the roll. In this way, cut each roll into about 12 pieces. Place the rolls on top of the caramel mixture and let them rise in a warm place for about 1 hour, or until they’re very soft. When they’re about double in size, place the rolls in a preheated oven at 350 degrees. Bake them for approximately 30 minutes, or until golden brown. 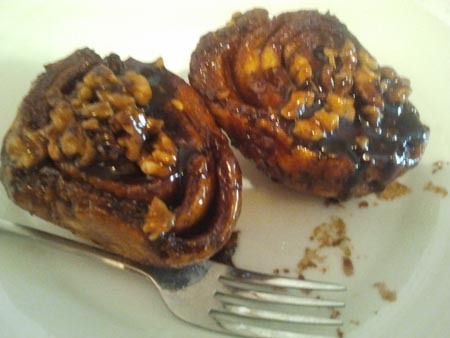 To serve, remove the rolls from the pan using a metal spatula and place them, caramel side up, on your serving dish. They are best served hot out of the oven.